We went to a high Mass, which meant that, although it only seemed like 1 1/2, Mass actually lasted 2 1/2 hours. For 2 1/2 hours, our girls were miraculously good. We only had to correct them a few times and, had I known it had been that long, I would have been more lenient than I was. Going to a Tridentine Mass with little ones can be a little more challenging than going to the ordinary form of the Mass. For one, it is generally quieter, so every noise seems to be magnified. There is also more standing, kneeling, sitting, standing, kneeling, sitting, etc. and when you are holding little ones, it takes on whole new dimensions. On the flip side, unlike the other Masses I've attended, when the girls made noise, not a soul seemed to care or take notice. And, when the movement became too much, we simply stayed seated. We did have to take Teresa out for a bit, but even outside the nave there were statues for her to gaze upon. Next time though, considering we have small children, we will definitely aim for a low Mass which should be at least an hour shorter. 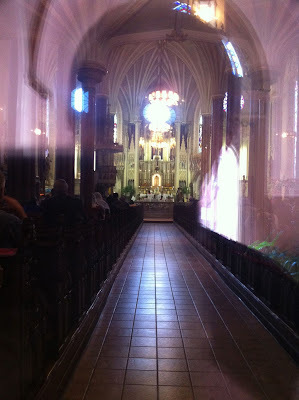 As for myself, I found the Mass exceptionally beautiful. During the consecration, four altar servers knelt with lit candles. Before them were two altar servers kneeling holding the priest's chausible. And then, before them, was the priest holding above them all, almost like at the top of a pyramid, surrounded by a cloud of incense, the consecrated Host. It was so beautiful. Now, St. Alphonsus provides books for you to follow along and sing all the parts of the Mass in Latin as well as understand them with an English translation. But if you don't want to, you aren't a person suspiciously not singing or a non-conformist or someone who is anti-social or lazy. Because everything is in Latin, there is an automatic trump card excusing you from singing or following along. But it doesn't mean you aren't experiencing the music or the Mass. On the contrary, sitting in a beautiful church, smelling incense, hearing beautiful solemn music, it becomes a multi-sensory environment with everything helping to lift your mind, heart and soul to God. It becomes a precious opportunity to meditate and pray silently, reflectively, raising yourself to God. Everything tries to help you leave the world and your week at the door and draw you closer to God. Now, certainly, you don't have to pray or meditate. You could sit there quietly irritated that everything isn't in English. But, personally, the rest of my week is in English and, as a stay-at-home homeschooling mom to four young girls, the opportunity of prayerful meditation is worth far more than any song I could sing. For me, it was a golden opportunity, one I wish I had more often. Now, I don't think the Ordinary Form is invalid or anything like that. Christ is Christ. But the Ordinary Form seems to focus much more on participation. It focuses on how much it can make you involved, leading you by the hand to sing this hymn, say this prayer, even instructing when you should and should not go to Communion. After going to the Extraordinary Form of the Mass, I kind of feel like the Ordinary Form IS the children's Mass, holding your hand and directing your thoughts through every step of the Mass contrary to the Extraordinary Form which provides the environment for you to meet God but lets you meet Him on your own terms, in your own words, at your own pace. There is nothing wrong with participation - singing, lecturing, ushering, etc. - but it makes you focus more on physically doing something rather than on praying or meditating. It is like filling your day with work and not taking any time to quiet your soul. There is nothing wrong with work; it can be very good. But without that time to quiet the soul, it becomes much harder to really enter into prayer. And constant participation makes it easier to fall into the belief that doing something is the equivalent of drawing closer to God, even if you are doing it mindlessly. All "Martha" and no "Mary" makes possible the illusion that "Martha" is all that is needed, is enough, or is as good as it gets. My thoughts after such a prayerful, meditative Mass were simply that, "Participation is overrated." The weekend we were there happened to be the Feast of Christ the King in the old calendar. 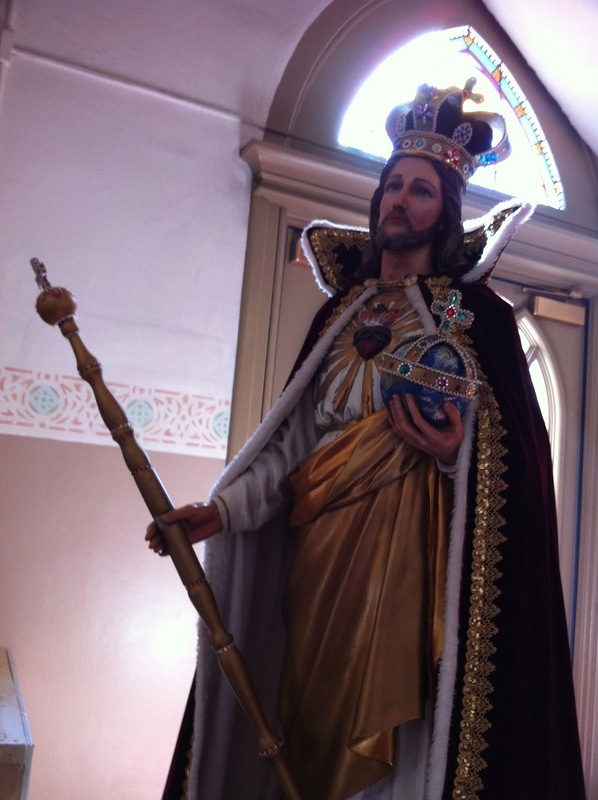 They had a life-sized statue of Christ the King which they processed on a platform. It was so beautiful. My girls loved it! It was interesting seeing their reactions to aspects of the differences in the Mass. Cecilia was especially fascinated by the priest going up to the altar each time to speak. My favorite comment had to be by Felicity though. When it came time for the homily, the priest climbed the steps up to the pulpit. (You can see the ornate, elevated pulpit in the first picture.) Felicity looked up in awe and said, "He's going to his castle!" Now, when was the last time anyone in your church thought it was a castle? 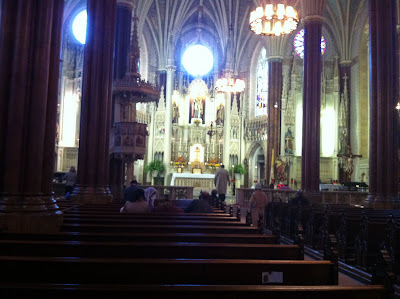 Does your parish look like the home of a King? I know our regular parish doesn't. Out of the mouths of babes. Comparing this Mass to the Mass a few weeks ago at our regular parish where a screen was elevated above the tabernacle to tell everyone all the good things their donations had done in Haiti were like night and day. It felt like I was in a theater and was so easy to forget where I was or why I was there. 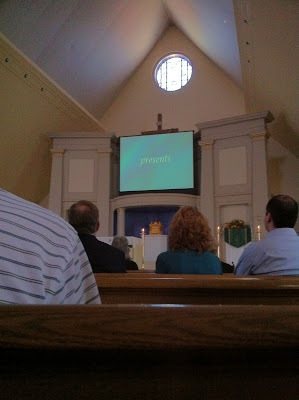 It wasn't just symbolic that the screen covered the crucifix. The Mass became focused on people and how their donations had helped people. Helping people is great! But to pat ourselves on the backs is not why we go to Mass. The Mass is never about us. It is about Him, praising Him and drawing close to Him. If you can go through Mass mindlessly, then it is failing you. And if you go through Mass and are not drawing close to Him, you are being cheated. 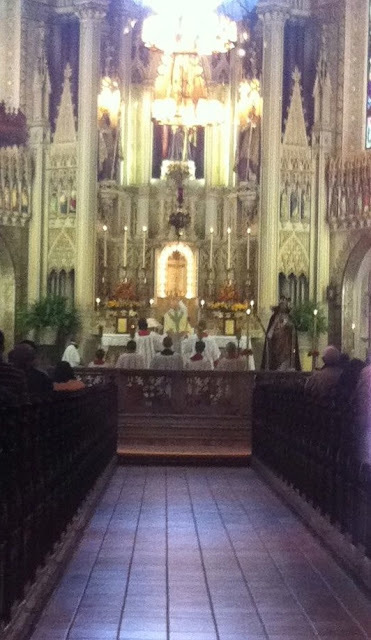 The difference between your N.O Mass sanctuary and the E.F. is jaw dropping. Thank you for sharing your experience. How were the people at St Alphonsus? The people at St Marys in DC can be a bit rude to newcomers(I've witnessed it myself) and it really put me off from going there. I live near Baltimore and would love to take my wife and 2 kids there. Thank you for your witness to the Mass of the Ages. May you have the opportunity to attend many more. My first visit to the Tridentine Mass in Seattle (about 90 minutes from home) was life changing for me and for our boys. My oldest son, a teenager discerning the priesthood, has declared that his first Mass will be said in the Extraordinary Form. He switched from praying with the English Post Vatican II Liturgy of the Hours to the old Latin Breviary. Wish we could have this option closer to home! In what way were they rude? A lot of the people at the old Mass are used to silence before and after Mass because they wish to recollect before and after Mass, and get sketchy when people break that. I can see how that might seem rude though. Or was it something else? Anonymous #2, everyone we met at St. Alphonsus was very nice. In fact they kept hopefully asking us to come back again. We are hoping to get back again soon. I've never been to St. Marys in DC but I am sorry to hear they are not welcoming to newcomers. If you live in the Baltimore area, I'd recommend giving St. Alphonsus a try. There is even a parking lot 1 block away that offers free parking for the morning Mass goers, so we didn't even have to pay for parking. Bridget, I'm so sorry there isn't one closer to you. Can you ask for one to be said closer to you? I've attended FSSP church before but when we moved to DC and went to St Marys we got a very holier than tho attitude from a few members. Now granted it was not all of them, but it was still surprising. It really put us off. When I went one Sunday I was lectured and asked if I knew what I was doing and not to be disruptive "if you're confused". DC was a trek for us anyway and Baltimore is much closer. We are new to the area and have been going to the EF in Silver Spring as well as a NO in Ellicott City, I think. Beautiful post Katherine. 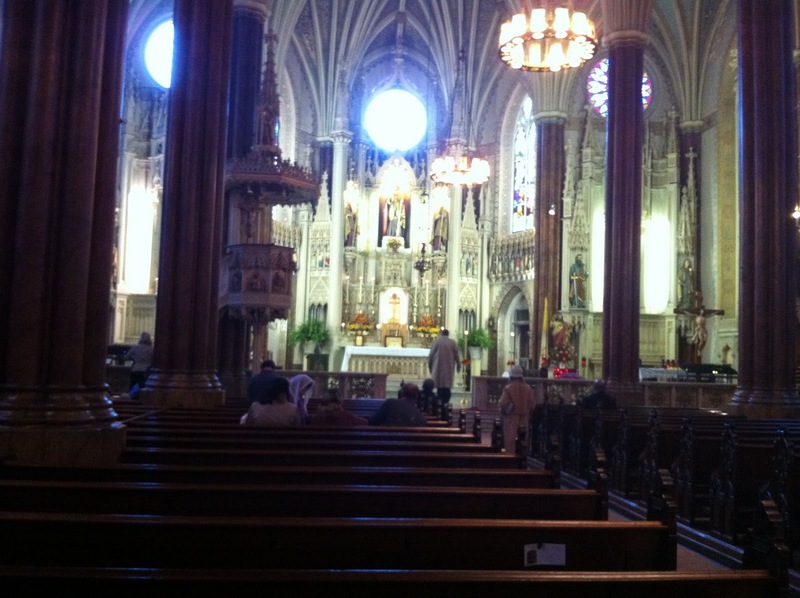 I love to go to St. Alphonsus for the traditional mass. I wish I could get there more often. You might be interested in Fr. Z's fisk of your post. Katherine, thank you for this beautiful post. Thanks be to God that you found this Mass and that you had this experience! Our family makes a 150-mile round trip each weekend to go to our parish (EF Sunday morning when I don't have to work and very reverent OF Vigil when I do) and we never regret it. Your experience with your daughters is not unusual--it's not just adults that are blessed by "The most beautiful thing this side of Heaven" as Fr. Faber famously said of the EF. As a homeschooler, certainly you are aware of how much our children absorb from the domestic church and from living a life of prayer in the midst of busy-ness. God bless you and may you continue to attend the EF! Jim, yes we are hoping to get there more often. I saw Fr. Z's post. He has some interesting comments. I didn't mean that the individual was on "auto-pilot" but that the Mass was and I also didn't mean to imply that because the Mass seemed to be on "auto-pilot" (that is, not requiring my voice to continue) that therefore the individual could or should sit there oblivious to what was going on not doing anything. I just meant that, since the priest and choir carried the Latin and no one was asking me to turn to a page and sing, I felt free to just bask in the beauty of the moment, to pray and meditate, to quietly direct myself to God. I think he and I probably agree and I just wasn't completely clear. I think I was using the word "participation" in a more narrowed sense applied only to the physical, active and outward. We are hoping to go again soon. My husband has even mentioned possibly changing parishes. As our oldest child will be beginning sacramental preparation in the next year or so (she will be 6 in January but finished all her Kindergarten work last week and began her 1st grade work) looking ahead to her sacramental firsts will be considered as well. Patricia, yes I am so grateful we were able to go and have an EF offered as close to us as we do. 150 miles! That is quite a hike. Can you request one closer to you? I'm hoping the girls will continue to be such angels when we go back. I will be fascinated to see how returning to the EF will impact our daughters and what other wonders they will discover from it. I still relish that "castle" observation. Thanks and God Bless!